I think this a way bigger issue in the Senate. But anyway one the many reasons to reform the election system, those wascally wedistricters. This is a reason to increase the size of the House. It’s been stuck at 435 since about the 1920’s (I think, not totally sure). Why 435? Because that is how many that can fit into the Capitol Building, and they don’t want to change the damn thing. I like the Capitol Building. It’s very pretty. But I like functional democracy a lot more. Why change the building. Just kill off some of the people in the over crowded districts. Start with the Democrats though please. So a bunch of people moved from Wyoming to Montana between 2000 and 2004. It’ll get revised in another couple years anyway. And how many of those Montana/Wyoming stats have been written of as “Bigfoot” sightings? You’re describing gerrymandering, which is a problem, but not what this chart is about. 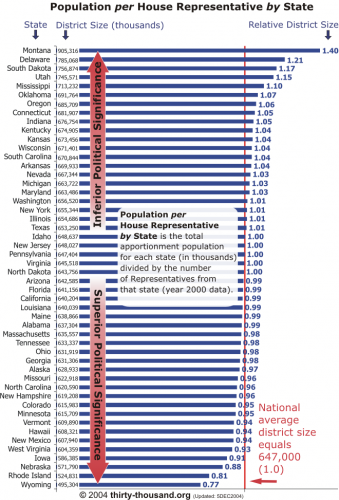 This chart is simply (Total population of state)/(# of House representatives), normalized to the mean. Nothing about how districts are drawn. Its a quirk of how the numbers are rounded to fit a legislature of 435. Yeah but but who rounds off those numbers? I swear to god dude I saw this image on a site about gerrymandering. Like on stumbleupon or something. I’m pretty sure the Census works out how many representatives each state gets. I don’t know how their formula works, but it’s probably based around getting each state as close to the average as possible. That’s why the states that deviate from the average on that chart are almost all single-district states: Montana can either be one over-average district, or two under-average districts. The redistricting is done every ten years, because that’s how often the Census is taken, and so how often the states are told how many districts they’ll have. yea gerrymandering used to be a big problem. I can’t remember how long ago, but i think it was in the early 1900’s. Either way it’s illegal now and like deutschlandia said the census determines the districts in each state so that there isn’t unfair representation. Umm, no. Gerrymandering is still a big problem. Gerrymandering based *solely* on race is illegal under the 1965 Voting Rights Act, but doing it for political reasons is still legal. And the Census doesn’t determine the districts, just how many districts each state gets. The states themselves set their own districts. This is done every ten years (because that’s when the state knows if it’s gaining or losing seats), unless you’re in Texas, when it’s done how ever often Tom DeLay wants. This chart is only tangentially related to gerrymandering.